April 2019 – Welcome to Wyandotte Daily! 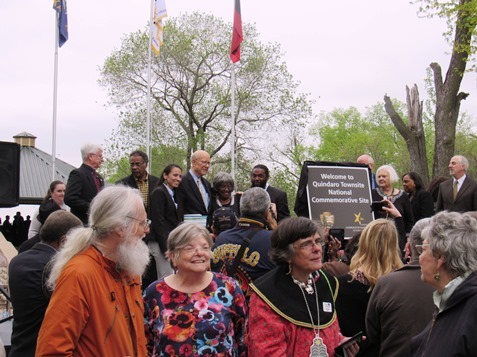 With the unveiling of a new commemorative sign, the Quindaro Townsite National Commemorative Site was celebrated today in Kansas City, Kansas. The event attracted several dignitaries and a crowd estimated at more than 200. 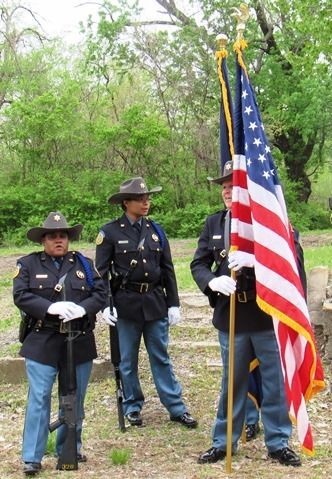 The celebration was held at the Quindaro Overlook on North 27th near the Missouri River in Kansas City, Kansas. 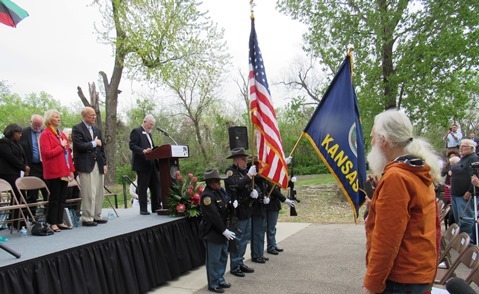 The event was sponsored by Freedom’s Frontier National Heritage Area, the Unified Government and the Kansas City, Kansas, Convention and Visitors Bureau. Quindaro, an abolitionist port town founded in 1857 in an area that is now part of Kansas City, Kansas, served as a site on the Underground Railroad in the pre-Civil War days. 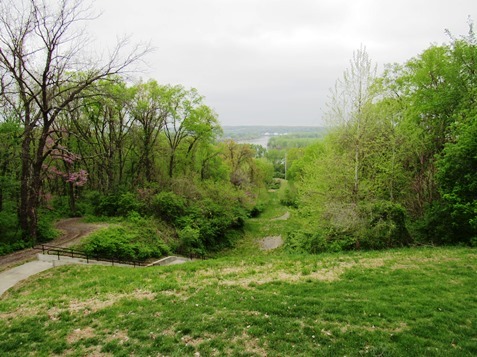 The historic significance of the site was almost lost in the 1980s when there was a proposal to put a landfill there. An archaeological survey of the area at that time, however, uncovered many historical artifacts still in existence, and the landfill was not approved. With the National Commemorative Site designation, there are hopes that the site can attract tourists who will visit and learn about history. 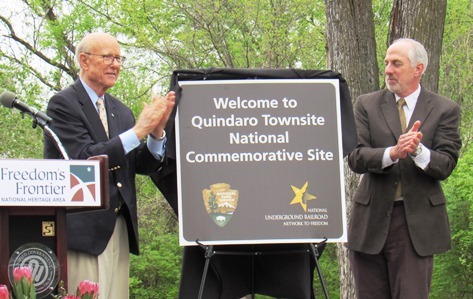 U.S. Sen. Pat Roberts, R-Kansas, who unveiled the new sign, sponsored the Quindaro townsite national designation on a bill that passed the Senate, and it was signed into law in March. Earlier, former U.S. Rep. Kevin Yoder, R-3rd Dist., had sponsored legislation for the Quindaro site, and U.S. Rep. Sharice Davids, D-3rd Dist., also introduced a bill for the Quindaro site. Today’s ceremony presented a united group of people from different political parties and backgrounds that is not found too often on many issues. 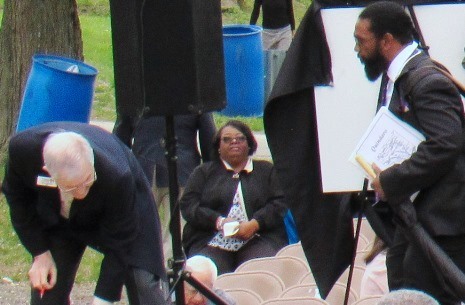 Several speakers recognized Marvin Robinson II, and his role through the years in protecting the Quindaro Ruins, and in advocating for legislation that would help provide funding for the historic site. 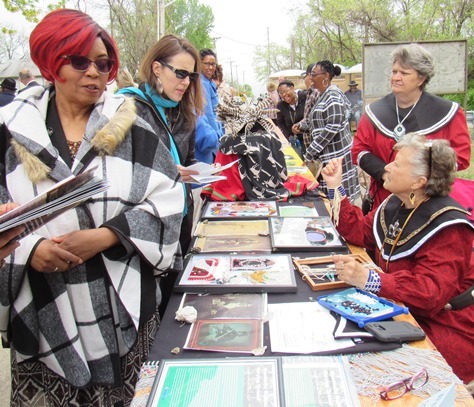 Janith English, principal chief of the Wyandot Nation of Kansas, said the area was once the home of her great-great grandparents, Ebenezer O. and Rebecca Zane. War eventually erupted in 1861, and families in Quindaro, some part of the Underground Railroad, were evicted by the Army, parts of Quindaro were burned and the town was rendered uninhabitable, she said. The Rev. 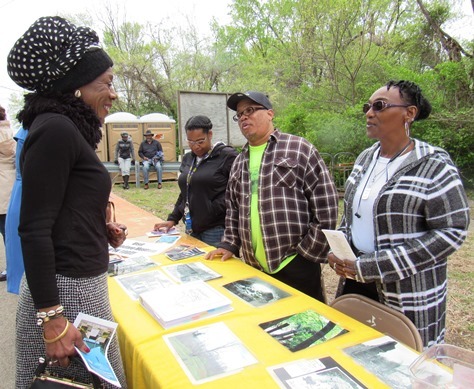 Stacy Evans, pastor of Allen Chapel AME Church, and with the Western University Association Board, said the national commemorative site designation opens the Quindaro site to new opportunities. The AME Church and Western University Association have taken care of the Quindaro site for years, as owners. Western University, at Quindaro, was the first and only African-American college in the state of Kansas, she said. The next step for the Quindaro townsite is to build a team of people, which will include the Environmental Protection Agency, the Kansas Department of Health and Environment, the Unified Government, the Vernon Center, the Old Quindaro Museum, Marvin Robinson, Freedom’s Frontier and the AME Church, she said. They will be working together to build trails, she said. 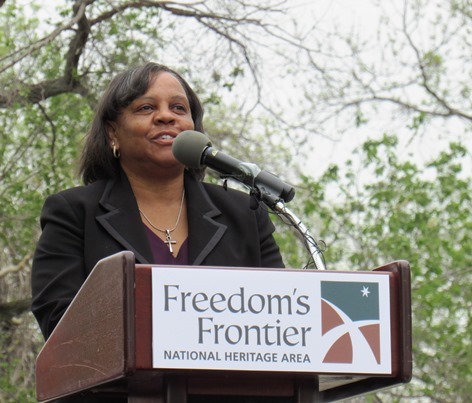 There are foundations, believed to be at least 28 foundations still there, making it the largest Underground Railroad site in the nation, she said. Some of it can’t be seen, and there is a discussion of using radar to locate the foundations. There are plans to build trails that will be accessible for senior citizens and children, and there is also a goal of building an interpretive center to display artifacts, she said. “The national commemorative site is a huge part of what makes it all possible,” she said. Now they can apply for state and federal grants that would help pay for the trails and improvements. This Quindaro site is the most requested tour in all of Wyandotte County, she said. Last year, she had people from Australia and New York asking for tours, she added. 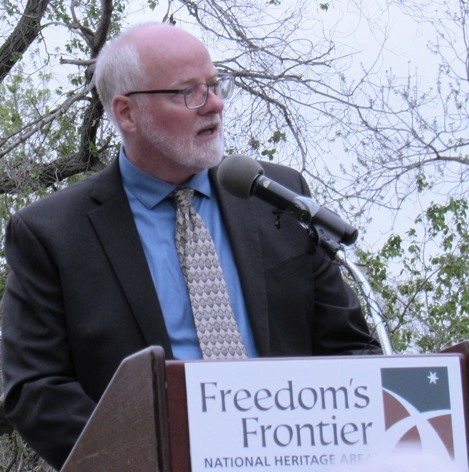 Kansas City, Kansas, Mayor-CEO David Alvey said today was an important moment for those who fought to protect this site. He thanked former Rep. Kevin Yoder, Congresswoman Sharice Davids and Sen. Roberts who carried this initiative to the capitol. 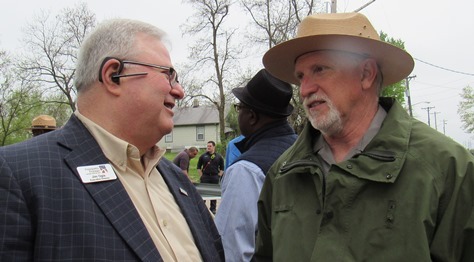 Brad Loveless, secretary of the Kansas Department of Wildlife, Parks and Tourism, said it is imperative to preserve, interpret and share the history of the Quindaro area. “We know that visiting historic sites is one of the most popular activities that travelers do,” he said. Travelers are seeking authentic and distinctive areas that have historical value, he added. The experience of visitors will “migrate over time,” he said, moving from their heads to their hearts as they understand the significance of what happened at Quindaro. 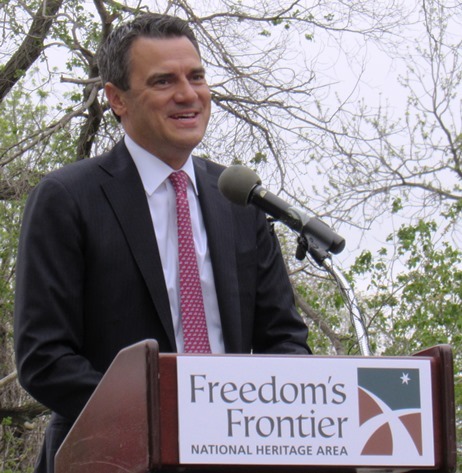 As an academic symposium was held last year on Quindaro history, former Rep. Kevin Yoder announced he would sponsor legislation on Quindaro. “Today is a moment of unity, in a world in which everything is so negative and so divided, this is the kind of thing that brings our country together,” Yoder said. Making sure the Quindaro history isn’t lost has been the work of several generations, he said. 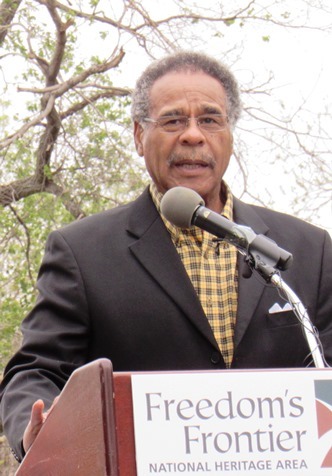 Last year, Marvin Robinson testified in front of the House Natural Resources Committee on a bill sponsored by Yoder. The challenge now is to reach the ultimate goal of the Quindaro townsite becoming a national historic landmark, he said. That would gain resources and the ability to build the architecture and infrastructure of what it needs to be. 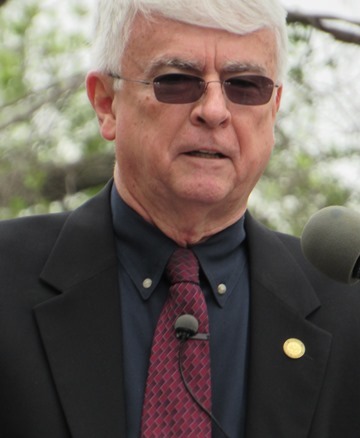 Jim Gulliford, administrator of the EPA’s Region 7, said there will be an opportunity for protecting natural areas as well as protecting historic ones. The EPA is committed to continue partnership in efforts to preserve the historical site, he said. Members of the brownfield team and environmental justice program will continue to assist in efforts for redevelopment, he said. 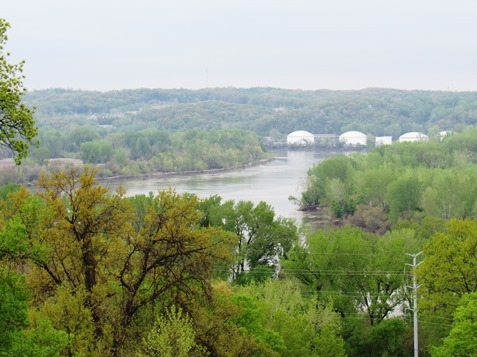 “EPA will continue to be an active partner in the redevelopment goal for the Quindaro Townsite and Kansas City, Kansas,” he said. He cited the history of Israel and how the people never want to forget what happened, so that it would not happen again. He said he hopes this project will lead to the complete restoration of Quindaro. He wanted the Quindaro project to be a way of showing children and grandchildren what their ancestors went through. “We can tell them their great-great-great grandfathers and great-great-great grandmothers risked drowning in the Missouri River,” he said. “There were great men and women who lived in that village, and those great men and women gave birth to the new African-American people all over this country. 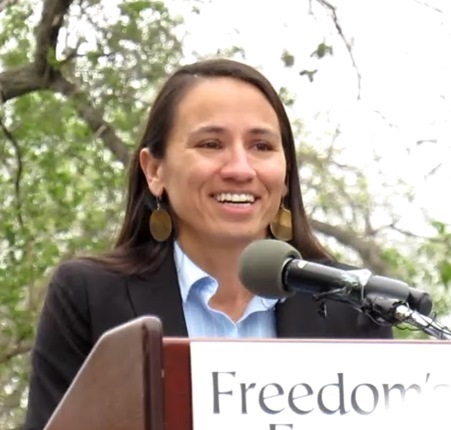 Rep. Sharice Davids, D-3rd Dist., introduced legislation in the House to make Quindaro a national commemorative site. Quindaro’s story was one of facing adversity and triumph, and it intersected much of the nation’s long, complex, storied history, she said. Rep. Davids noted that the name Quindaro meant “a bundle of sticks,” and its significance was that “in union there is strength. “When we come together to do anything, there is strength in that, and that is what we’re striving to do,” Rep. Davids said. She said there was a collective strength from many individuals who came together to make sure that Quindaro’s history was preserved. Sen. Roberts told the crowd he had particular interest in Quindaro because his great-grandfathers were newspaper editors and abolitionists in the mid-1800s. The Oskaloosa Independent, edited by one of his ancestors, was burned down by Quantrill’s raiders because it was a leading voice for abolition, a free state and freedom. Another great-grandfather was kidnapped by troops from the South. Sen. Roberts said Quindaro’s residents, surrounding landowners and native Americans all worked together to help escaping slaves to freedom. Thanks to many individuals who worked together to unearth its historic significance, the Quindaro Ruins were saved and the Quindaro story will live on to be shared with future generations, Sen. Roberts said. “This demonstrates the rainbow that has been referred to, of America, and that you had everybody concerned to make Kansas a free state,” Sen. Roberts said. “It just indicates how we could work together and be leading spokespeople for the cause of unity for freedom, for independence for America, for what America truly stands for,” Sen. Roberts said. Sen. Roberts said the National Park Service stands ready to work with the community on this project. 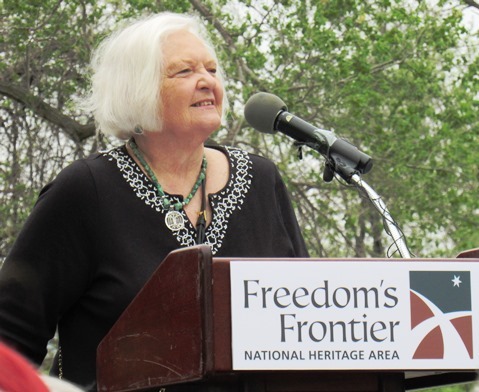 According to Judge Duane Benton of the U.S. 8th Circuit Court of Appeals, of the Freedom’s Frontier Board of Trustees, Freedom’s Frontier covers about 41 counties in eastern Kansas and western Missouri and is dedicated to preserving history. 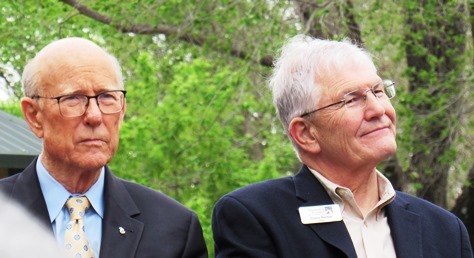 Sen. Roberts and then Sen. Sam Brownback established the heritage area through legislation introduced in 2005. Unified Government Commissioner Gayle Townsend represents the 1st District, where the Quindaro townsite is located. 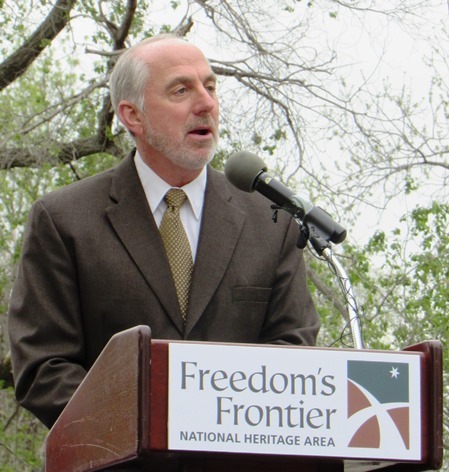 Freedom’s Frontier approached the UG Commission about it a few years ago and asked for their support. 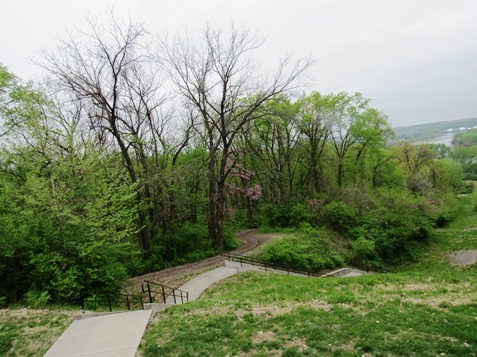 Funds for the development of this national site now are expected to be more readily available through federal and state grants. “This is really special to me because somewhere near here was Douglass Hospital, where I was born,” Commissioner Townsend said. There’s so much history here, starting with Wyandots, abolitionists and slaves who went through Quindaro, risking their lives on their way to freedom, she said. She noted that many groups came together for today’s event. “Now the challenge is to keep the synergy going,” Commissioner Townsend said. Jazz music is filling Kansas City Kansas Community College this week as the 2019 Kansas City Jazz Summit returns to the main campus. The Jazz Summit is 8 a.m. to 6 p.m. April 23 to 26 in the KCKCC Performing Arts Center, 7250 State Ave. The event, which is produced by the Kansas City Jazz Alliance, is free and open to the public. The Jazz Summit caters to jazz groups at the middle school, high school and college level in both competitive and non-competitive sessions. It is a collaborative effort between the KCKCC Music Department, Audio Engineering Department, Theater and the Intercultural Center. Awards are given for outstanding soloists, woodwinds, brass and rhythm section performers. • Kansas City Jazz Heritage – “Basically Basie.” This is a competitive category on Thursday of the Jazz Summit. Groups are required to pick three songs from an established list of Count Basie repertoire. These selections must have been recorded by the Count Basie Orchestra. Judging is based on the authenticity and attention to detail. The top two groups will compete for audience voting, which is done by text message. The winning group receives a cash prize as well as a traveling plaque. Olathe Northwest High School Raven Jazz I won the competition last year. Each day, groups from throughout the region perform. Local schools attending the Jazz Summit include Wyandotte High School, Turner High School, Washington High School, Harmon, Schlagle, Lansing, Basehor-Linwood, Tonganoxie, Blue Valley North, Blue Valley Northwest, Blue Valley Southwest, Olathe West, Olathe East, Olathe North and Olathe Northwest. In addition, KCKCC ensembles, including the Fusion Vocal Ensemble, Vocal Lab, The Standard and Funk Band will perform the first day of the summit. Clinicians for the summit include Jim Mackay from Winnipeg, Manitoba; Scott Prebys from Bismarck, N.D.; Harold Jones from San Francisco, Calif.; Bill Richardson from Northwest Missouri State University; Todd Hastings from Pittsburg State University; Chris Burnett from Leavenworth, Kan. and vocal jazz specialists Mike Engelhardt and Paul Langford. For complete schedules for all three days of the event, visit www.kansascityjazz.org/kansascityjazzsummit.html. Levi Baker of Kansas City, Kansas, is one of 23 Washburn University students recently inducted into Phi Alpha social work honor society. Phi Alpha offers membership to social work students, faculty and practitioners. The organization was created in 1962 and has more than 450 chapters across the country.